As the number of graduating students approaches infinity, the work each student must do to get ahead also approaches infinity. Meanwhile, here's a look at China. According to unwritten rules at many universities, students cannot graduate if they do not find a job, Southern Metropolis Daily reported in July last year. "We are simply being out-competed by children in India and China. They are not smarter than our children. They are just working harder," Education Secretary Arne Duncan told the MSNBC television in an interview yesterday. They seem to be worked harder. I guess that's something. There are also just so darned many of them. This is the new normal. This is our truth. "I'm proposing that we take 30 billion dollars of the money Wall Street banks have repaid and use it to help community banks give small businesses the credit they need to stay afloat," Obama said in his first State of the Union address. The credit they need to stay afloat? Why does this feel like a payday loan? What's wrong with this picture? How far is that really going to go? Each small business could use this new debt to postpone laying off one worker for one week? Is that the plan? Of course, the debt will still exist and it will clearly need to be paid back. I think I shall remain bearish on job creation. Yeah, I think that's exactly what I will do. One large business (AIG) got $85 billion. 22.9 million small businesses get to split $30 billion. If you are a small business owner, get out the party hats. Relief is on the way. It's one-sixty-five-millionth of an AIG bailout. It's not all gravy and biscuits though. You may not have the shrewd negotiating skills of an AIG when asking for the money at your local "community bank". Try not to seem too desperate. That's only considered to be a great tactic for businesses too big to fail. Bubble or no bubble, official figures show 85 percent of Chinese can no longer afford to buy properties. And Chinese authorities are worried the situation will create social instability. That much is clear from the fate of a popular television soap opera, Dwelling Narrowness, which was pulled from the airwaves. The show charted two sisters' struggles to buy an apartment, with one of them eventually becoming the mistress of a corrupt official. The show coined a saying: "To buy a place in Shanghai means you are digging a grave for yourself, and burying your love." It should play out much like our housing bubble's aftermath. It's only a question of timing. Expect Chinese stocks to fall. Expect global stocks to fall. Expect global commodities to fall. Expect diversification strategies to suffer. I don't think gold will be much of a safe haven this time around. I think it is at least partially tied to the China story. Further, I don't think it can keep going up if other commodities fall. The speculator and philanthropist George Soros warned today that growing political resistance to fresh state borrowing risks pushing the global economy into a double-dip recession next year. Think about that for a minute. If we the people are fed up with bailing out banks (which we clearly are) and Congress bends to the will of the people even just a little bit (which they have recently shown interest in doing), then what will stop the deflationary forces from playing out? I think the only things propping up this economy are the bailouts and the stimulus. Without that, hello deflation. It's kind of like antibiotics. You can't just take a few pills and then stop once you start feeling a bit better. The deflation bug has not been cured yet. The cause still exists even if the symptoms are not as noticeable. The toxic assets are still in the system. I could be wrong but this does not seem to be an ideal time to be taking "sure thing" inflationary based risks. I don't mind sitting in cash right now. I've been doing it two months so far. No complaints. For what it is worth, my $80 oil ceiling prediction continues to hold. Caterpillar said Wednesday that its fourth-quarter profit tumbled as demand remained weak, but the maker of mining and construction equipment expects sales to rebound in 2010 as the economy improves and dealers replace inventory. Leading the way will be China and other developing countries where an increasing share of the company's yellow-and-black machinery is sold. This moth is attracted to the flame. The State Council has demanded frantic bank lending that has generated far too much liquidity, a stunning increase in commercial property sales, and an even more unbalanced economy. The American version of this policy ended badly and the Chinese version will as well, whatever official data say. What's wrong with the official data? Much published Chinese data is unusable, unemployment being an obvious example. For the sake of argument, let's assume that the data is usable. If Chinese data are accurate, policy is therefore headed straight off a cliff--constantly pushing real GDP growth near 10 percent but in an increasingly futile and clearly unsustainable effort to create jobs. So what happens when it all falls apart? The surge in property prices must eventually halt. This will expose investors, from individuals to the biggest state banks, to heavy losses that will then be compounded by ensuing stock market weakness. If true, savvy Chinese investors and/or global commodity investors better get a clue. This sounds a lot like Professor Plum in the Conservatory with a Lead Pipe. Russia - thanks to its reserves and stabilisation fund - is likely to be immune from many symptoms of a double-dip crisis, but if demand does fall, Russia could be hit hard by collapsing commodity prices. That's just one of those things I have to read multiple times to fully grasp the economic subtleties. Each round is followed by a thwack and a forehead bruise though. Picture my head meeting my desk. Anyone want to predict the odds of a double-dip crisis that also has stable demand? I'm tempted to guess 0%. The son of "legendary" Ken Fisher tells us that China's Real Estate Bubble is a myth. Well, that sure is comforting! The price of real estate in Beijing has been strong, with an average hovering around 18,000 yuan per meter squared, or approximately $240 per square foot. $240 per square foot seems perfectly reasonable to me. Based on the definition issued by UN, he who earns less than 1 dollar per day falls into the category of extremely poor. A third of China people belongs to this group. $240 per square foot represents a mere entire year's wages for one-third of the Chinese population. That's what I call pricing power! Wow! Picture working all day long on one square inch of new home construction (you'd only have to do 144 square inches of them in a year to justify your salary). Think of how perfect you could make it. I'd probably hand carve an elaborate pattern to let the world know I was there and that I really matter. Should it continue we can expect to see 400 million Chinese construction workers at some point. I mean really. Who wouldn't want a part of that? Just imagine the future prosperity. There's clearly a limit on available land, but that's where skyscrapers come in. How high could they be built? Do you suppose Ken Fisher taught his son all he knows about the real estate market? He had to learn it somewhere. Right? The zero-interest rate environment and rapid monetary growth are scaring conservative savers into becoming budding speculators. By threatening to destroy the value of cash and by subsidizing speculation with low interest rates and bailouts, good guys really finish last. It may be better surfing the speculative waves than staying put. One may die in a speculative crash, but holding onto cash when governments are hell-bent on printing money to solve every problem seems like certain death. Check out this saver in particular. Apparently Chanos is getting to him. Digital Journal also reported last week that Rogers believes a food shortage will occur within the next few years, which will force commodities to spike in prices. Brace for the sarcasm. Here it comes. Everything certainly is coming together for China this century. No doubt about it. There's nothing quite like a real estate bubble and/or potential food shortages to unleash all sorts of future prosperity, especially for an economy so dependent on stable employment, cheap food, and the absence of James Cameron movies. According to Hong Kong's Apple Daily newspaper, the Chinese government is concerned with the possibility of parables between the Na'vi (the indigenous population of the planet Pandora who must fight to maintain their way of life in the face of a human military operation) and Chinese residents who have to put up with aggressive repopulation by property developers. Apparently, the fear is that the film may "lead audiences to think about forced removal, and may possibly incite violence." Hey China, here's an upbeat replacement movie idea. It's a sign of the times that we are now seeing articles like this on MSN Money's website. Better late than never I guess. If you already have a lot invested in the stock market, perhaps real estate is the way to go. That's some seriously messed up logic. Why would the amount of money you have in the stock market alter your opinion on what real estate is worth? Real estate is either a bargain or it isn't. It’s just not the sure thing people always make it out to be. Agreed. If real estate does not end up being the "sure thing" people always make it out to be, then the stock market won't be a "sure thing" either though. In my opinion, you can't have one without the other. In other words, I don't think it is a coincidence that the stock market fell apart when the housing market did. There are times to be taking big risks in the stock market and housing markets and there are times not to be. Right or wrong, I'm still bracing for more deflation. Housing prices are certainly cheaper now, but are they actually cheap? As I look to Detroit's housing prices and our nation's ongoing unemployment nightmare, I tend to wonder. If you "already have a lot invested in the stock market", then good luck to you. The stock market has gone nowhere in the last 10 years. Based on the massive and unprecedented rally during the last year just to get it back to that level of nothingness, I would argue that at least a few investors are convinced that it is a "sure thing" yet again. I wouldn't claim to know though. I'm certainly not one of them. The average number of people in an American household declined from 2.69 in 1985, 2.76 in 1980 and 3.14 in 1970, the bureau said. The number increased slightly in 1983, apparently because households stayed together for economic reasons after the recession of 1981 and 1982. 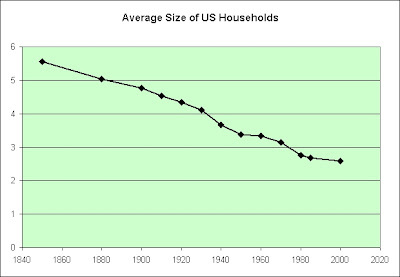 The decline nationally in household size is not a new phenomenon. Although it has drawn attention in the last decade, it is part of a trend that dates at least to the last century. The average number of people per household was 5.55 in 1850, 5.04 in 1880, 4.76 in 1900 and 4.54 in 1910. It declined to 4.34 in 1920, 4.11 in 1930, 3.67 in 1940, 3.37 in 1950 and 3.33 in 1960. The Census Bureau projects that the average will continue declining, to 2.48 in the year 2000, from the current 2.67. Note that the long-term trend is no longer declining at a rapid pace. The Census Bureau's 1987 target for the year 2000 was not reached. There's a risk that the long-term trend is forming a bottom. There's an additional risk that it won't just bottom, but that it will actually begin to reverse. The stock market's been stagnant for a decade. Unemployment is now extremely high. The population will most likely continue to grow, but if more and more people live together in the same household ("for economic reasons" as seen above) then that's just one more headwind for the housing market. One could argue that the household size might continue to shrink if people stopped having children for economic reasons though. Of course, in that case our population wouldn't grow. That would really hurt the ponzi scheme nature of our economy. How could we continue to borrow prosperity from our children and grandchildren if we don't produce any? Japan's population is set to drop this year for the first time since records began more than a century ago, according to a government report. Japanese women have cited inadequate child care, low part-time wages and long hours worked by their husbands as some of the reasons why they do not have any children, or only have one. Historically, birth rates have fluctuated with the economy. Record lows were recorded during two economic crises: the Depression in the 1930s and the Arab oil embargo in the 1970s. I've often argued here that we are trying to combine the very best of The Great Depression with the very best of the 1970s. Sigh. In summary, there is a risk of household formation growing due to economic reasons and population growth slowing due to economic reasons. Neither effect would help solve our national housing glut. Both of my favorite commentators (William Pesek and Andy Xie) are tag teaming China this week. As the Great Recession wanes, there’s no better example of the Great Consensus than China. The overwhelming view is that it can grow 10 percent indefinitely, its potential is boundless and it’s run by omnipotent geniuses who can’t lose. China is today’s New Economy and anyone who disagrees just doesn’t get it. The overwhelming desire for getting rich quick dominates every nook, fissure and strata of Chinese society. Such desires cannot be fulfilled; the terrible logic of economics is that money must circulate. Creating bubbles can temporarily blind people to this logic, as overvalued assets substitute for money to fill psychological needs. This is why, whenever conditions permit, China seems to have asset bubbles. Jim Rogers vs Jim Chanos: Is China in a bubble? But global commodities investing guru Jim Rogers has blasted Chanos for what he has said on China. Rogers, who has been passionately investing in China for the last few years, says that China is not in a bubble as Chanos has predicted. Rogers, who shifted his residence to Singapore two years back as he felt that Asian countries like China have huge investment potential, says that Chinese economy is on strong and sound foundations. In my opinion, never become emotionally attached to your investments. I started this blog at the very peak of the Chinese stock bubble. I heckled China on my very first day. Perhaps the humor is funnier now though, at least in hindsight, so let's try again. The part that heckles China's stock market starts at the 1:20 point in the video. It still cracks me up! China didn't stand a chance. But in a sign the volume of oil imports might not reflect real demand, the country, traditionally an importer of refined fuel, flipped to being a net seller as a 64 percent leap in exports outstripped a 39 percent rise in imports. The glut of fuel could be set to increase -- trade sources have told Reuters that China has lined up more crude from Kuwait, Saudi Arabia and Iraq this year, and a Reuters poll found refiners planned to start the new year with record crude runs to embrace market optimism. The question mark over 'real' demand for oil in a year of stockpiling and rampant production in China, has made it harder for traders and the government to judge the level of real economic activity. “The easiest way to look at this now is to compare where copper prices were the last time inventories were this high,” said Ryan Atkinson, the chief market analyst at New York-based Balestra Capital Ltd., which oversees $1.1 billion. “We think copper belongs at about $2, given the fundamentals,” he said, meaning $4,409 a ton. Back in 2004, copper was in the midst of a six-year rally that sent prices up more than four-fold by the end of 2007. It gained 37 percent in 2004 because supplies monitored by the London Metal Exchange, the world’s biggest metals bourse, were in the middle of an 89 percent plunge -- the biggest drop since at least 1971. Today, stockpiles are heading up. Copper has climbed 52 percent since June 30 even as global inventories rose for six straight months. That’s the longest supply increase since 2008, when prices collapsed by a record 54 percent as the recession slashed demand. Stockpiles monitored by the Shanghai Futures Exchange more than quadrupled last year, a sign the country may have overbought in the aftermath of a 4 trillion yuan ($586 billion) stimulus program. Copper has fully recovered to its 2006-2008 average bubble level. I'll pass. The administration's lack of fiscal restraint is going to result in unprecedented levels of printing by the Fed. Under the current forecast, the U.S. Treasury needs to raise around $4-trillion to finance a $1.5-trillion deficit and to replace Treasury debt that is due to expire in 2010. In the last five years, issues of new Treasury securities have already climbed from a couple hundred billion dollars to $1.5-trillion in 2009, to double that in 2010. The debasement of the dollar that started in 2009 is certain to continue -- and with it inflation will come, starting in 2010. I'm a believer. Sign me up! I was a stagflationist as I read the first article. I turned into a deflationist as I read the second article. I just reread the first article and became a stagflationist once more. I then reread the second article and became a deflationist again. This clearly isn't working. Perhaps there is someway I can read both articles simultaneously? I can't seem to resolve the uncertainty. In quantum mechanics, the Heisenberg uncertainty principle states that certain pairs of physical properties, like position and momentum, cannot both be known to arbitrary precision. That is, the more precisely one property is known, the less precisely the other can be known. The most likely outcome to me appears to be a combination of stagflation and deflation. In other words, more of the same. The two 'flations will cancel out as The Great Depression's deflation meets the inflation of the 1970s. That's really all the Fed is attempting to do. If one were to simply look at the price of toilet paper, one could easily argue that the Fed has been successful so far. Toilet paper's price has risen at a slow, stable, and predictable pace over the last decade. That's in spite of two major stock market crashes and a massive real estate bubble popping. I guess it is because The Great Depression's high unemployment will continue to meet the high unemployment of the 1970s. Those two do not cancel out. Sigh. The Great Depression's stock market will also continue to meet the stock market of the 1970s. Those two do not cancel out either. Neither era was good for stocks. I guess that's why I haven't owned any stocks since 2004. And, more basically, what if optimism that we dodged another Great Depression is hubris and markets tank anew? Treating the symptoms of the financial crisis isn’t the same as removing the causes. Speaking of treating the symptoms, I've been coughing up stuff of a questionable color for the past few months and finally decided to see the doctor yesterday. I'm mostly better but wanted a second opinion. It's just been dragging on so long. No fever. Blood pressure was good. Throat looked okay. Chest sounded okay. The doctor gave me a prescription for antibiotics but suggested that I don't fill it unless I started feeling worse. I really don't like taking medications unless they are proven to be absolutely necessary. I was therefore an easy sell on that advice. I also told my doctor that it felt like 2004. I turned bearish then because I felt we were borrowing our recovery. I really do think we're doing it again, only bigger! I do have some good news though. I just saved 35% on my car insurance by... No wait. That's not it. I saved 35% on my office visit by using "prompt pay". That means that that I paid before leaving the building. On the one hand, we see payday loan stores selling cash at a premium to people who desperately need it. On that same hand, we also see businesses willing to accept less cash up front for services rendered rather than risk getting even less cash later. So where's the other hand? Cash sure doesn't seem like trash to me, regardless of what the government has tried to do to its value. I guess one could point to oil. I stick to my theory that it is overpriced though. I thought $80 would hold but also acknowledged that it could hit $100. I just don't see it staying there since I think China is in a lot more trouble than most can believe. High oil prices hurt them more than us, since high oil prices imply high food prices (poor people spend more of their money on food). And lastly, being self-insured since April hasn't hurt me so far (knock on wood). It cost me $100 to see the doctor. That's my total medical expenses for the past 8 months. Maybe I should write the insurance company a note and thank them for denying my application (due to a minor acne problem on the outside of one of my eyelids that has since been cured).